(Serves 6) Field mixed greens with cucumber, diced tomatoes, shredded carrots, Parmesan cheese and house vinaigrette. (Serves 12) Field mixed greens with cucumber, diced tomatoes, shredded carrots, Parmesan cheese and house vinaigrette. (Serves 6) Baby spinach, shaved red onions, candied pecans, crumbled goat cheese, grape tomatoes. Served with a homemade house vinaigrette. 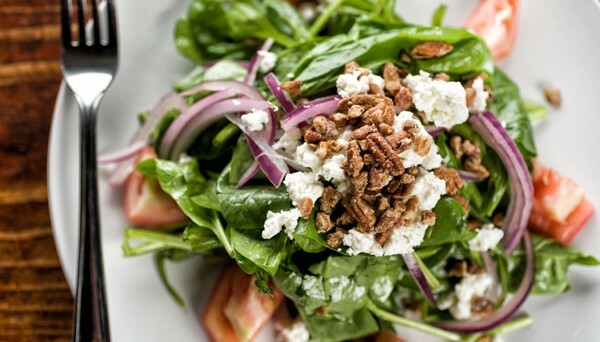 (Serves 12) Baby spinach, shaved red onions, candied pecans, crumbled goat cheese, grape tomatoes. Served with a homemade house vinaigrette. (Serves 6) Hearts of romaine, shaved parmesan served with herb crostini and homemade caesar dressing. (Serves 12) Hearts of romaine, shaved parmesan served with herb crostini and homemade caesar dressing. Mixed greens, blue cheese, pickled beets, shaved red onion, grape tomatoes, candied pecans served with a warm bacon vinaigrette on the side. Arugula, kalamata olvies, cherry tomatoes and feta cheese served with a balsamic vinaigrette on the side. Grilled shrimp, roasted red peppers, olives, ricotta cheese, romaine lettuce and mixed greens served with a house vinaigrette on the side. Crusted black pepper tuna, quinoa, kale, roasted pineapple, bell peppers and tomatoes served with a honey lime vinaigrette. Hearts of romaine lettuce, tomatoes, feta cheese, black olives, red onions and cucumbers served with a red wine vinagirette on the side. Tossed salad greens with kalamat olives, feta cheese, red onions, tomatoes served with a red wine vinaigrette on the side. Kale with roasted beets, pears, pecans and blue cheese served with blackberry vinaigrette on the side. Hearts of romaine, shaved parmesan served with herb crostini and homemade caesar dressing. 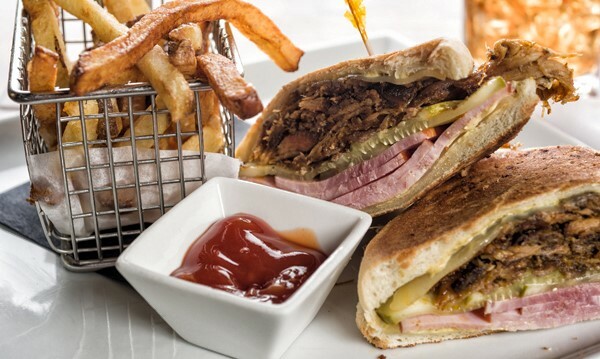 Ham, pulled pork, pickles, creole mustard and Swiss cheese on ciabatta bread. Served with homemade chips and a cookie. Grilled chicken breast with pepper jack cheese, avocado, lettuce, tomato, red onion with chipotle mayo. Served with homemade chips and a cookie. Grilled chicken breast and grilled portobello with spring mix, tomato and honey mustard. Served with homemade chips and a cookie. Yellow onions, pickled jalapenos, green and purple cabbage, carrots, Dijon mustard, mayo and bbq sauce served on a brioche bun. Served with homemade chips and a cookie. Cranberries, walnut chicken salad, spring mix, rolled up in choice of wrap. Served with homemade chips and a cookie. Wing sauce drenched chicken, lettuce, tomatoes, diced avocado, blue cheese crumbles in a ranch sauce rolled in a tortilla wrap. Served with homemade chips and a cookie. Pan seared shrimp with spring mix, tomatoes, onions, cilantro wasabi mayo, rolled in a tortilla. Served with chips and a cookie. Grilled tender steak with blue cheese aioli, caramelized onions rolled in a tortilla wrap. Served with homemade chips and a cookie. 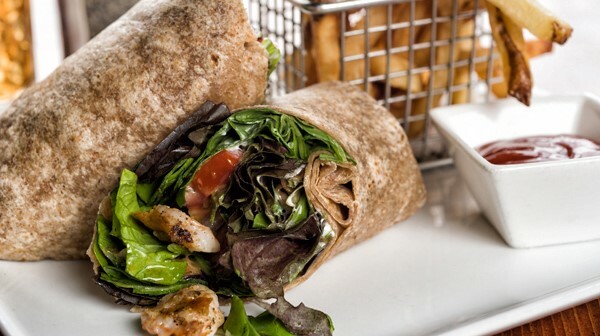 Grilled chicken breast with spring mix, tomatoes, cheddar cheese, cilantro mayo rolled in a tortilla wrap. Served with homemade chips and a cookie. Grilled onion, tomato, zucchini, yellow squash, green bell pepper, portobello mushroom, lettuce, all rolled in a tortilla wrap. Served with housemade chips and a cookie. (10) Yellow onions, pickled jalapenos, green and purple cabbage, carrots, Dijon mustard and mayo served on a sour dough slider bun. (Serves 8 - 10) Pineapple, cantaloupe, honey dew, green and red grapes.